Pit Liners are most commonly known for containing some type of waste or by-product. They have also been used to contain water for energy industries such as oil, gas, and fracing (fracking). Some of the terms often used as well as pit liners is oil remediation pads, lagoon liners, oilfield pits, waste treatment ponds, drilling pad liners, & temporary storage pits. Western Environmental Liner provides a wide array of liner materials for these applications. All Pits are not made the same or for the same containment so it is important to choose the proper material. We can also provide unique products that provide extra protection for particular projects. Please contact Western Environmental Liner to find out what options are available. Understanding which pit liner is the best option normally has to do with understanding the properties of the liquid it will be containing. 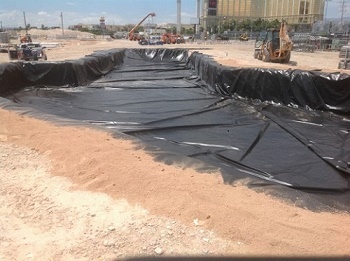 Most likely Western Environmental Liner’s Aqua series of liners will be the best option for pit liners that will be primarily containing water. Pit liners where the containment of light chemical mixtures of parts per million and low levels of various byproducts might mean that pvc or polypropylene may be the best option. No matter which particular geomembrane liner is chosen, Western Environmental Liner can weld many pit liners in one large piece or offer turnkey installation with very large panels pre-welded in our factory to reduce field time and help prevent potential leaks from occurring. Western Environmental Liner’s experience with many different chemical combinations helps you make the best pit liner choice for your particular application.